Nicholas of Haddon Township, diagnosed with Hodgkin’s Lymphoma and now in remission, will travel to Australia in January with his family. On Friday, Dec. 7, Make-A-Wish New Jersey and Macy’s hosted a special celebration at the Cherry Hill Mall. 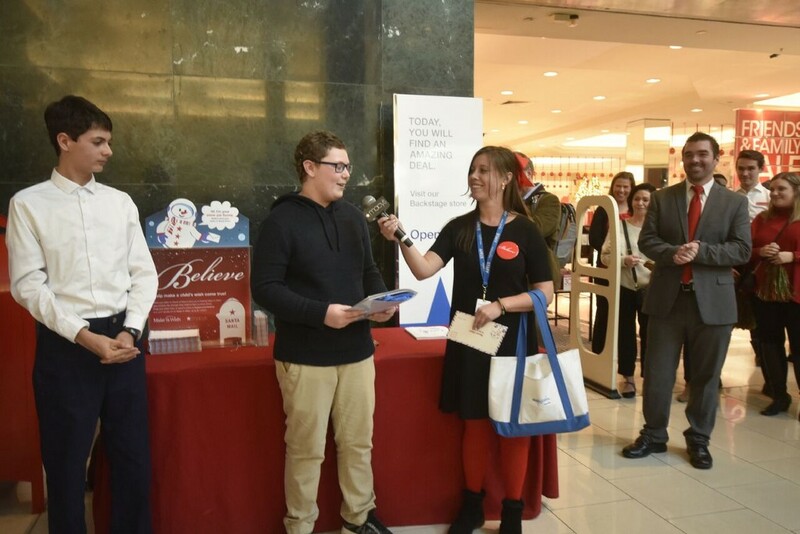 As part of the annual Macy’s Believe Campaign and in honor of the 35th anniversary of Make-A-Wish New Jersey, both organizations partnered together to host a surprise “wish reveal” for 14-year-old Nicholas from Haddon Township. Make-A-Wish creates life-changing wishes for children with critical illnesses. Nicholas, diagnosed with Hodgkin’s Lymphoma and now in remission, wished to travel to Australia and visit the Great Barrier Reef. On Friday, in front of almost 100 guests and following a mini press conference with several featured wish alumni who have received wishes over the years, it was revealed to Nicholas that his wish shall be granted, and he and his family will travel to the land down under in January. A celebration immediately followed with cheering fans, signs raised high in the crowd for Nicholas, confetti, and well wishes from everyone in attendance, officially welcoming him into the Make-A-Wish family. Nicholas’ wish will be granted thanks to the generous support of Macy’s. 2018 marks the 11th anniversary of the Believe Campaign. Each year, Macy’s invites “Believers” of all ages to send their letters to Santa at a Believe station at their local Macy’s store or online at macys.com/believe. For every letter received now through Dec. 24, Macy’s will donate $1, up to $1 million, to Make-A-Wish. On Dec. 7, National Believe Day, Macy’s doubles its donation for each letter collected, up to an additional $1 million, bringing the goal to $2 million for Make-A-Wish. Macy’s has donated more than $112 million to Make-A-Wish since 2003, including more than $17 million through its annual Believe campaign. This funding has helped grant thousands of wishes. The wishes bring unmatched joy and hope to children and families across the country, impacting entire communities.